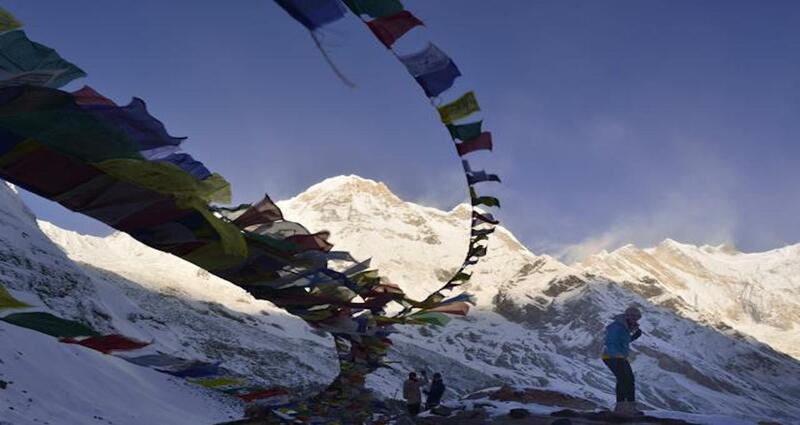 Annapurna base camp trek route is a most popular trek route among the adventure lover, either they are professional trekkers is a boggier one. Annapurna base camp trek itinerary can be made from 8 days to 14 days, it depend on choicd of trekkers that how many days they do have for the trek and how many villages in the mountain they would like to touch during the trek of Annapurna base camp trek . and take you to your hotel. In the event that you arrive in the morning, you can visit our office to get more information about the trek while in the mean time, we get to know each other even better. Your second day in Nepal can come handy as we give you an option of cultural tour around Kathmandu, the city of temples. You will visit some of the UNESCO World Heritage sites including the three Durbar Squares viz. Kathmandu Durbar Square, Patan Durbar Square and Bhaktapur Durbar Square. Swoyambhunath, often called monkey temple is another major attraction for most of the tourists. In the evening, one of our representatives will come to you to explain about the trek. We leave early in the morning by tourist bus. Travelling by bus has its own fun. Your six hours of long ride to Pokhara will give you an immense opportunity to know Nepal almost in detail. Come across the interesting lifestyle Nepalese people live in both city and village area. You will not see much difference except more greeneries as you move away from the city and of course glimpses of Ganesh Himal, Manaslu and Annapurna Himalayan Range. By late evening, we will reach and check in at the hotel in Pokhara. Our destination for today is Tikhe Dhunga. After having breakfast in Pokhara, we head for a long 5 hours walk along the banks of two beautiful rivers; Modi Khola and Burundi Khola to reach Nayapul where we stop for our lunch of the day. Birethanti and Ramghai are two old villages en route to Tikhe Dhunga. We will be staying overnight at a lodge here. After a hot breakfast in Tikhe Dhunga, we start our journey to Ghorepani. Our trek today will be a bit tiring as it includes steep climb up the stone staircase to Ulleri for more than an hour. On the way to Ghorepani, we cross a dense rhododendron and oak forest leading us to a small village Nangethanti where we stop for lunch. It will take us total of six hours to reach Ghorepani where we stay overnight at a local lodge. We wake up early at the dawn today so we can hike up to Poonhill to get that stunning sunrise view over high Himalayas. Total of 400 meter and 45 minutes of walk uphill will take you to the top of the hill. Upon reaching the view point, you will catch sight of three outstanding eight thousanders of the world: Annapurna I (8,091m), Manaslu (8,156m) and Dhaulagiri (8,167m). For breakfast, we will descend back to Ghorepani and later in the afternoon trek to Tadapani which grants you a spectacular view of Hiunchuli, Annapurna South and Annapurna II. We will stay overnight at lodge in Tadapani. Today’s trek will cover 4-5 hours of descending down from Tadapani through deep forests, screaming rivers and terraced field till we reach Chhomrung. Gurjung village is about an hour and half away from Tadapani which will be our stop during the trek today. From here is a slight ascending uphill for next 45 minutes and a straight walk of 2-3 hrs to Chhomrung. We will spend our night in Chhomrung. The trail to Dovan follows down a long staircase till Chhomrung Khola. After crossing Chhomrung River, we will now trek uphill to Sinuwa at the elevation of 2,340 meter. We stop for lunch in a local village called Bamboo and then walk past the magnificent rhododendron and oak forest for an hour to reach Dovan. After a night in Dovan, the next day brings us to our final trek before we set our foot in the Annapurna Base Camp. On the way to ABC we walk past a small settlement in the mountains: Deurali village. As the valley widens above this village, there are places with high-risk of avalanche. You will see warning boards on the road. As we turn left of the trail past Machhapuchhre Base Camp, you will realize the air gets thinner and that you’re near to Annapurna Base Camp. Annapurna Base Camp gives you a pleasant sight of some major peaks counting Machhapuchre Himal, Annapurna South, Annapurna I and Hiunchuli. We will stay overnight at Annapurna Base Camp. Today will be one of the longest walks throughout the trek as we have to descend about 2000 meters down from ABC. We leave for Bamboo early in the morning after taking hot breakfast in Annapurna Base Camp. In next 6-7 hrs, we will reach Bamboo via Deurali Village, Machhapuchre Base Camp and other remote villages. We stop for lunch in one of these villages and as we arrive at Bamboo, we will take rest and spend our night there. From Bamboo we trek for half hour through jungle to Sinuwa then walk down to Chhomrung River. After climbing up a long stone staircase of almost 310m, we reach Chhomrung. It will take maximum six hours for us to reach Chhomrung from Bamboo. After morning breakfast in Chhomrung, we trek down to Ghandruk, a village of Gurung inahabitants. The trail to Ghandruk is followed by remote mountain villages and stunning Kim Rung Khola. A long six hours of trekking will bring you to Ghandruk village. We will spend our final night here in Ghandruk savoring the taste of Gurung culture in one of the local lodge. In our final day, we are going to trek leisurely through Birethati and Nayapul and finally to Pokhara. You will find lots of tea houses along the trail. These tea houses are the best place to drop by for short breaks in between your trek. From Nayapul, we will get a bus to take us back to Pokhara. We check in back at our hotel in Pokhara and spend the last night in rejoice of completing our annapurna base camp trek successfully.